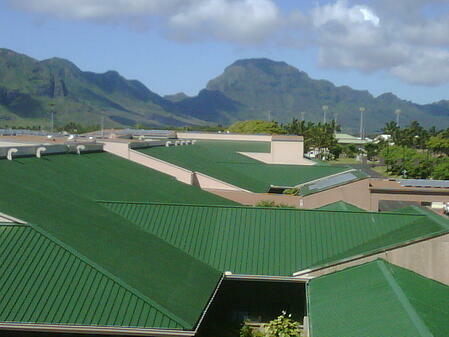 Lihue Airport, located on the Island of Kauai, had an aged metal roof with several leaks. One of their biggest challenges was they needed a roof system that would restore their roof while allowing them to continue normal, day-to-day operations. This airport is the primary airport on Kauai and the main gateway for visitors, so there could be no business disruptions or closures during the application process. The airport is open 24/7 and is occupied throughout the day and evening. 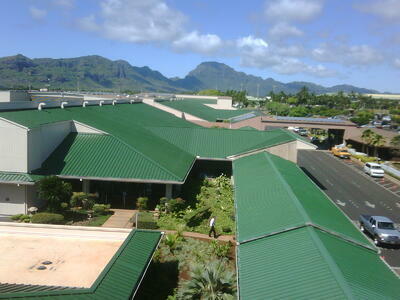 The roof coating system provided the Lihue Airport with superior waterproofing, excellent reinforcement for seams, a leak-free and monolithic roof membrane, and most importantly - there was no business closure or disruptions! Metal roofing has a reputation of being an extremely durable roofing substrate that has been successfully used on buildings for over 70 years. Many warehouses, agricultural facilities, food processing, heavy equipment manufacturing, schools and now churches use metal roofing as they provide excellent strength with heavier gauge steel, speedy installation and lower upfront costs over traditional roofing systems. Extending the life of an aged metal roof by using a metal roof coating system is a viable and excellent option as opposed to the other available options of single ply membrane retrofits, roof hugger systems (additional metal layover of the existing metal panel) or the most expensive and disruptive complete removal and re-skin option with all new metal. Recoating metal roofs can lower roof maintenance and prolong the lifespan of the roof indefinitely, when maintained properly. As a metal roof ages, the factory applied coating be it galvanized, baked on paint, Kynar or even Anodized protection of the metal panels deteriorate, fasteners break, seams fail, and rust occurs. When the protective coatings that are baked onto the metal panels during manufacturing have worn off, the panels are exposed to environmental elements making them vulnerable to roof failures. The fasteners, which hold the panels together, deteriorate over time and begin failing due to the roof constantly expanding and contracting. This occurs due to normal every day temperature fluctuations and are increased drastically when there are sudden swings in temperature such as a cold fronts, hail impact and rain cooling off of a heated surface in the summer when temperatures of the panel can be in excess of 150+ degrees. These broken fasteners and open seams occur due to stress related exposure and become avenues for water that will surely penetrate the system and enter the building’s interior. Sealants, tapes and caulks that have no UV protection commonly used to waterproof joints and areas between the panels, lose their elongation and recovery abilities, making it difficult to keep up with the buildings‘ constant movement without weakening. Screws and washers become loose and fall off, needing inspection, tightening and replacement. Metal panels can develop rust, needing either full replacement of the panel or the use of a special rust inhibitive primer to restore the panels. 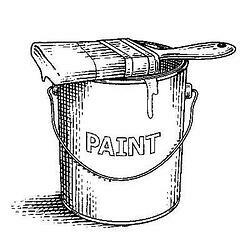 The application of rust inhibiting primers are commonly left unprotected and eventually fail. The most common repair material used is asphaltic mastics and should never be used as it is not even meant to be applied directly to a metal panel and must be removed prior to any application of an approved coating for these metal structures. Recoating a deteriorating metal roof using one of our AcryShield Metal Roof Coating Systems will allow you to solve all the issues mentioned above and leave you with a fully restored, watertight, maintainable and sustainable roofing assembly. Restoring the roof involves the removal of rusted panels by cutting out the areas that have fully rusted through the panels and replaced with new and like profile to the original so as to promote a solid and continuous seal to the original panel(s). Our low VOC primer, RustShield is then applied to fully combat future rusting of the panels. The AcryShield System offers a choice depending on the severity of degradation to the existing metal. A butyl tape with cloth backing can be applied over all seams and around the base of penetrations, curbs and flashings for a fully sealed and watertight substrate. Screw heads can be encapsulated with either a trowel grade or brush grade AcryFlex mastic and if warranted due to extreme movement/failure a 3-course application of mastic and membrane can also be used to negate future expansion and contraction issues in lieu of the butyl tapes. Next, a base coat with excellent adhesion to metal is installed for exceptional waterproofing. Finally a finish coat containing an industry leading UV protection package is applied. The end result is an easily maintainable and renewable solution that provides long-term performance and low life-cycle cost, along with the added bonus of increased energy efficiency. Download our FREE Metal Roof Coating Systems Brochure for additional information or call us at 800-423-9557. 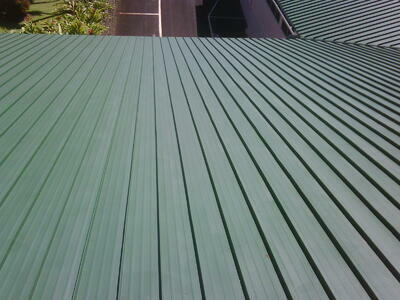 What is Reflective Roof Paint? Reflective roof paint is actually not paint. The proper terminology is “reflective roof coating”. While roof coatings resemble paint, they are much more durable and the thickness and strength is unmatched to what paint is capable of. Reflective roof coatings are designed to be installed on a horizontal surface, such as a low-sloped roof, tolerating many external stresses and having contact with water for extended periods of time. Reflective roof paint would not possess the ability to be a protectant to your roof or be used as a waterproofing mechanism to your building. 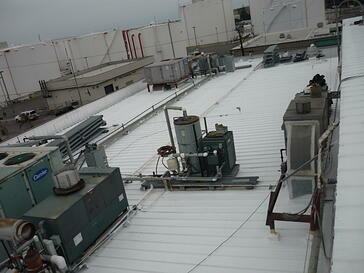 Roof coatings protect the building from water penetration during wet weather, dew, fog, and ponded water situations. The coating is able to repel the water, absorbing none of it into the roof substrate below. These coatings are tough enough to be walked on when roof maintenance and equipment on the roof top needs to be serviced. Roof coating systems have a required mil thickness that provides strength and durability, offering adequate protection to the roof’s surface. The thickness also allows for the membrane to expand and contract sufficiently, without cracking or splitting. This flexibility allows the roof to move with the building during different temperature fluctuations. The next biggest difference between a paint and a roof coating is a roof coating has the ability and ingredients to reflect the sun’s heat away from the building, blocking UV rays from being absorbed into the structure. This allows the building and roof to remain at a cooler temperature, reducing air conditioning usage and cost and reducing roof degradation and deterioration, enabling it to last longer. There are many different roof coatings available, some are tougher and more durable and others are better at reflecting the harmful heat from the sun. We have a list of different organizations on our website that offer unbiased tests and ratings for you to research, to determine and guarantee you are getting the best roof coating product that meets your needs. Contact National Coatings and speak to one of our roofing professionals for any questions you may have. We are here to help!